When the book Bootleg Elvis appeared in 2012, it sold out almost immediately, and became an instant favorite of collectors all over the world, most calling it the ‘Bootleg Bible’. Since then, additional rare bootleg titles have been discovered, not to mention many unexpected variations of some classic albums. So, it seemed to be time for a new and updated look at the bootleg world. Whereas Bootleg Elvis mainly relied on text to tell the story, this new edition chooses to focus on photographs. Using the 2012 classic as a reference point, the producers decided to feature scans of every cover, label, piece of vinyl and insert for you. This will make it easy to identify each and every pressing and variation. They also decided to split the original book into two volumes. 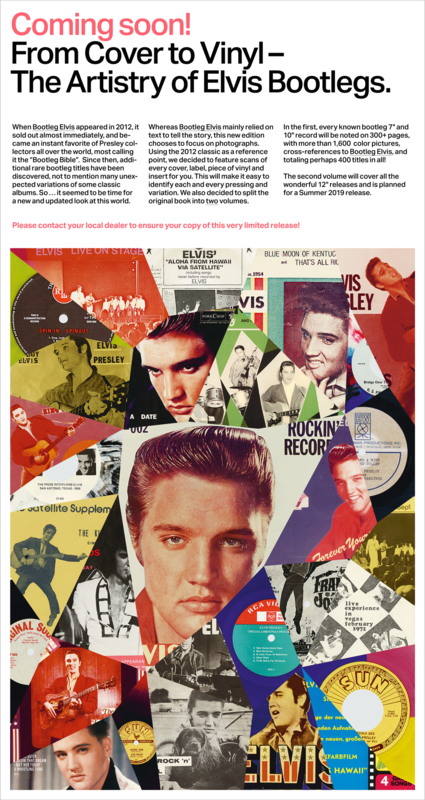 In the first, every known bootleg 7” and 10” record will be noted on 300+ pages, with more than 1,600 colour pictures, cross-references to ‘Bootleg Elvis’ and totaling around 400 titles in all. The second volume will cover all the wonderful 12” releases and is planned for an early 2019 release.